Archaeologists are planning to install thousands of 3D cameras in war zones - in an attempt to preserve historic buildings at risk of destruction by Islamic State. Scientists from Oxford and Harvard Universities will "flood" the Middle East with 5,000 cameras in the coming months, which will take one million images by the end of 2016. Should vulnerable buildings and artefacts be destroyed, the detailed images could be used as a blueprint for recreating them with 3D printers. 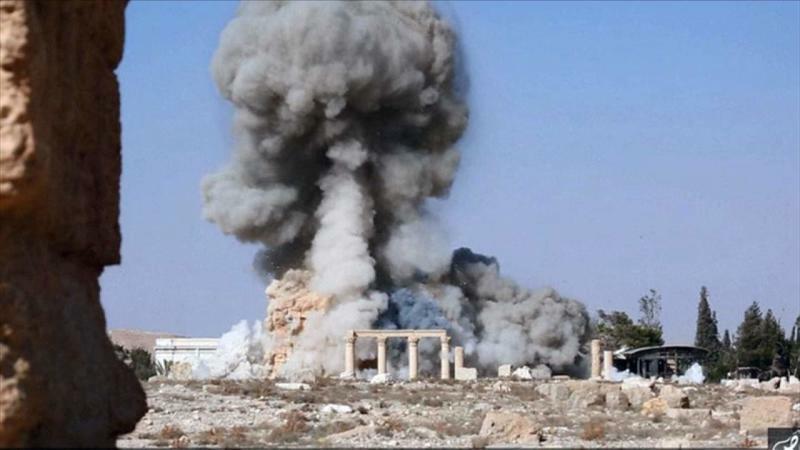 "The Million Image Database Project" comes days after Islamic State supporters released photographs which appear to show the destruction of the Baal Shamin temple in Palmyra. It is the latest demolition to take place in the ancient Syrian city - with militants regarding the Roman-era structures as pagan and sacrilegious. Roger Michel, from the Institute for Digital Archaeology, told The Times: "Palmyra is rapidly becoming the symbol of Isis's cultural iconoclasm. "But there is hope. By placing the record of our past in the digital realm, it will lie forever beyond the reach of vandals and terrorists." His team hopes that the 3D cameras - costing as little as £20 each - will be suitable for "inexperienced users" such as military personnel and charity volunteers in the region. After taking images of buildings from several angles, they would then be asked to upload images to a database being stored at New York University. In the weeks before Palmyra was captured by IS in May, Syrian officials said they had moved hundreds of ancient statues to safe locations, for fear they would also be destroyed.